If you are organising an urn tribute with Handy Flowers, you are guaranteed a first-class service as we like to offer our customers flexibility and options. That is why you have the choice of whether to get your floral tribute yourself or have us organise urn tributes delivery to the service on your behalf. We know each customer will have a personal preference on how to handle this, so just speak to our team and let us know. But rest assured, if you do choose to have us do your urn tribute delivery, we will not let you down. We will make sure it arrives at the desired location on time and in pristine condition because your loved one deserves only the best. Place an order with us! 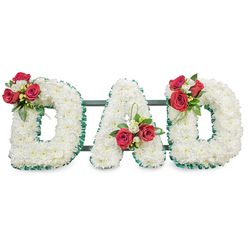 When choosing floral tributes for someone who has died, you want to make sure that you select the most fitting option. Something that reflects who that person was and what they loved in life. And at Handy Flowers that is something our florists take very seriously, so they will work with you to ensure that the funeral flowers or urn tribute we design are made with your loved one in mind. We have plenty of previous examples that we can share with you to help inspire you, but no matter what you choose, trust that you will only ever get the most stunning, high-quality urn tributes from our expert London florists. Do you have questions about the funeral flowers for your loved one’s service? Maybe you’d like to know what different types of flowers for funerals mean or discuss the different floral tributes available? Or perhaps you’d like to understand how the process, from ordering to funeral flower delivery, works? Whatever your question may be, our florists are available to answer it. We are the local flower shop that you can rely on for friendly, helpful, honest advice. So whether you’d like to order an urn tribute or just want to ask a quick question, feel free to call us on 020 3409 3030 any time. 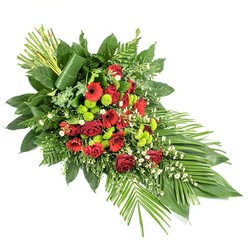 On top of having gorgeous funeral flowers designed for your loved one’s service, one of the things our customers like most is that we offer a hassle-free way to have funeral flowers delivered too. Whether you’d like funeral flowers delivered to your home ahead of the service, or at the location of the ceremony on the day, our dedicated florists will make sure it happens. 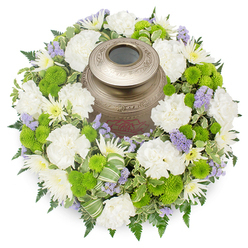 We will get your urn floral tribute where it needs to go, at the time it needs to arrive. 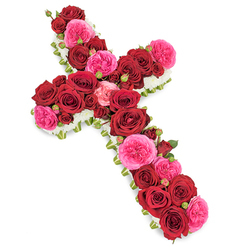 No need for you to wonder or worry when you choose Handy Flowers for funeral tributes. While our urn funeral tributes are a very popular option for cremations, we like all of our customers to know that we are able to design funeral flowers of all kinds. We can do small urn tribute arrangements or large, extravagant displays. This could include casket sprays, letter tributes, or funeral baskets. Our aim is to make sure that we create a fitting tribute for that special person you are honouring, so just let us know what they liked and the kind of display you think is most fitting, and we’ll work with you to design a funeral tribute to honour their memory. 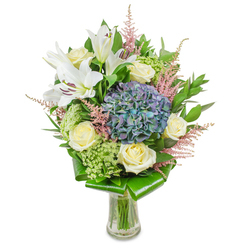 Many of our customers don’t know that urn floral tributes are even a thing before they come to us. They believe that their only option is a traditional bouquet or wreath. But for those who want to lay a special floral arrangement with the urn of their deceased, a floral urn tribute is the ideal solution. You may choose this as the only arrangement, or just one of many to be included. But whatever you decide, we will help you create something that truly honours the memory of that special person who has been taken from your life. 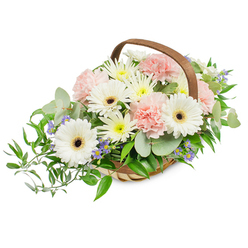 We know that funeral flower delivery can be a source of stress for many of our customers. And we know how important it is that the urn tributes are delivered on time. That is why we pledge that you can always count on us for funeral flower delivery, whether it’s a local service or being held across the country. We want you to be able to forget any worries about whether your display will arrive or not. Trust us, Handy Flowers has got you covered. And we can keep you up to date every step of the way if you want to give that added peace of mind. Order an urn tribute delivery and see for yourself! 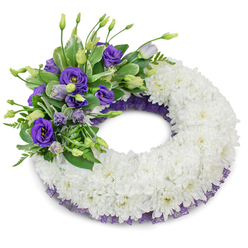 Having a glorious arrangement of funeral flowers really is a sight to behold at a funeral or remembrance service, and we believe that everyone should be able to afford top-quality funeral flowers for their loved one no matter what. That is why we offer a fantastic range of affordable flowers that will suit every budget or circumstance. We aim to offer as much flexibility as possible to ensure that you can afford flowers for your loved one’s service, so if you have any concerns over money for flowers, give us a ring on 020 3409 3030 and we’ll see what we can do to help.